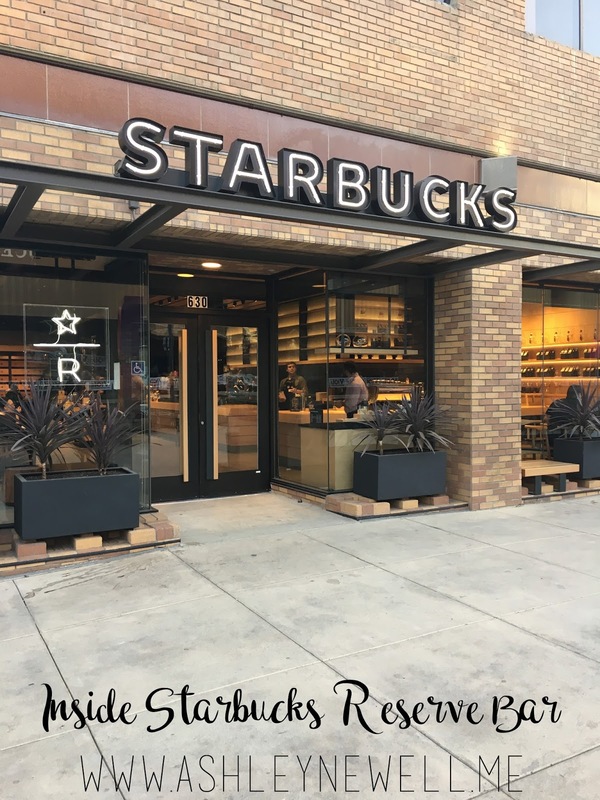 I'm super excited that Sacramento now has a Starbucks Reserve Bar! (They are all over the world with an expected 1000 locations by the end of 2017.) I was lucky enough to be invited by my amazing friends over at SacFoodandBooze to experience the Starbucks Reserve with them during a special influencer event. I'm a HUGE Starbucks fan as you guys probably know because I've written about them many a time! 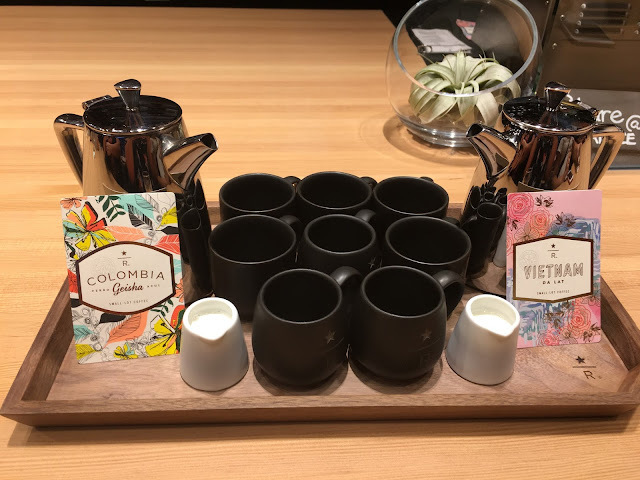 I'd never been to a Starbucks Reserve location before and I was beyond excited to try it out! 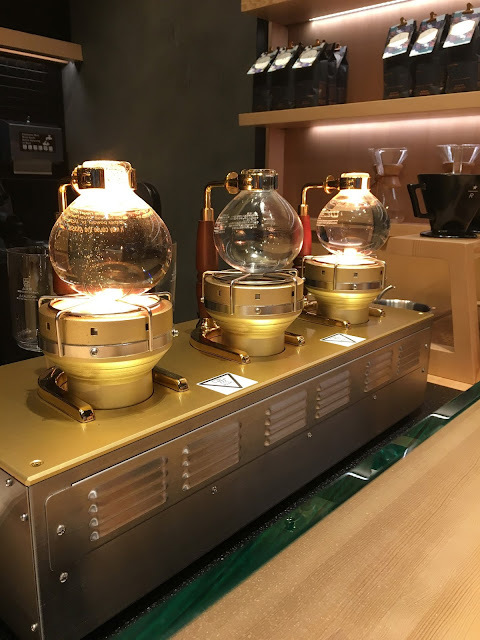 Now, I HAVE been to the big Starbucks Roastery in Seattle so I had an idea what it would be like. I would say that the Roastery has a Reserve Bar in it. They both also have what you'd find in a regular Starbucks inside too. It's like Starbucks inception... so you can find all your local Starbucks favorites at the other locations but not vice versa. What I wasn't expecting is that each Starbucks Reserve is designed to reflect the city it is in. Ours has basketball bleachers since it's right by The Golden One where The Sacramento Kings play. The Starbucks Reserves are the stores where the Reserve coffees from the Roastery are served and sold in bags. 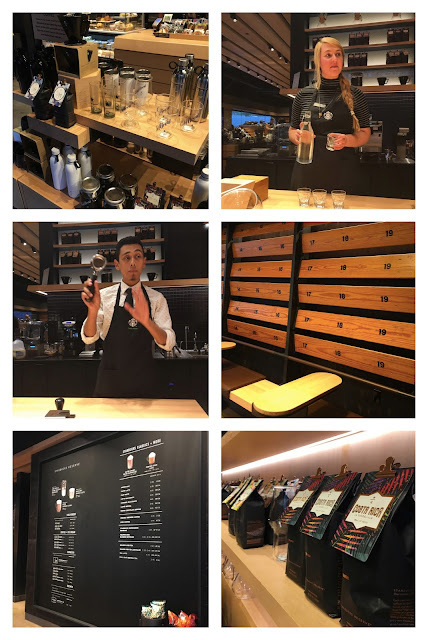 If you go to the Starbucks Reserve, you HAVE to sit at the actual Reserve Bar to see the baristas do all the different methods of brewing including clover brewing, pour over, cold brew, chemex, and more. (You don't HAVE to but I highly suggest you do to get the experience!) They have manual espresso machines where the baristas have to stamp out and pull the shots themselves as opposed to the automatic machines at most places. This takes a lot more training and artistry than other machines. Baristas at the Reserve Bars also get trained on latte/foam art which doesn't happen at your run of the mill Starbucks. The most awesome thing to me is the Siphon Coffee. I'm just fascinated by the science that goes into it! 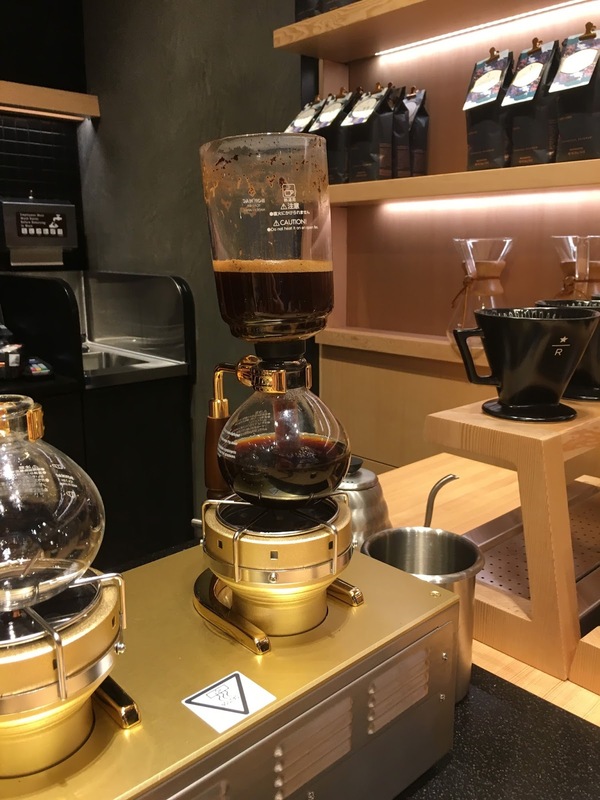 The coffee is fully immersed in water then vacuum filtration is used to coffee from the grounds. 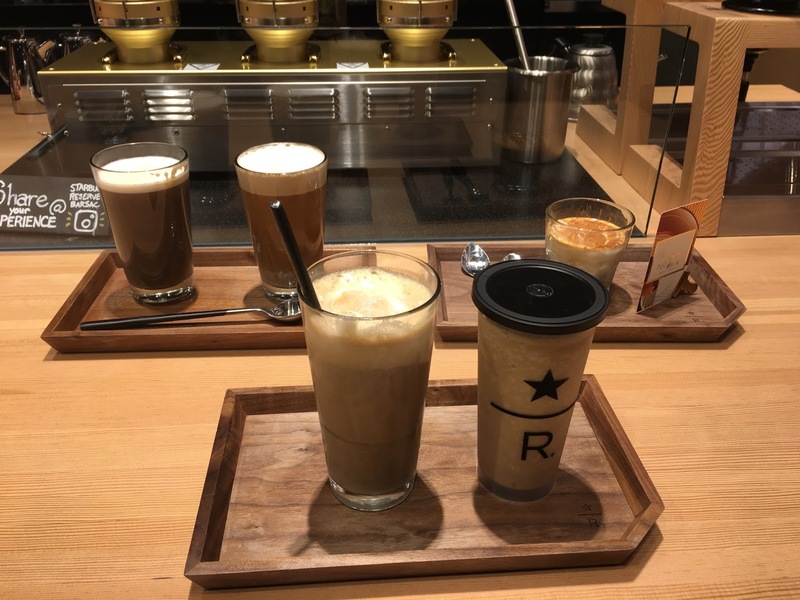 The Reserve also offers nitrogen infused coffee (nitro coffee) which gives it the texture of beer with the bubbles and the foam. I LOVE the nitro in a float because ice cream, duh! And obviously since they have ice cream, they serve affogatos and even a malted shake with coffee! It's all so good and perfect for dessert! They also have coffee flights if you want to taste the difference between reserve beans or brewing methods. It really is an experience! If you LOVE coffee like I do, then Starbucks Reserve should be on your list. Take a friend or significant other on a coffee date. Maybe go after dinner to try the ice cream drinks. This is so cool, I’ve actually never heard of this before now! Now I want to go to one! I've never even heard of this before. It looks so awesome! I need to find out if there is one near by me or anywhere we're traveling! Ok this is so fun! Need to go to one. That place looks so cool and I bet it smells AMAZING in there! Even though I don't drink coffee I have always loved the smell of it, yum. What!! That looks AMAZING...I"m not sure I'd ever leave if there was dessert as well...I would like one of everything! These all sound amazing, my mouth is watering! I've been dying to try affogato for awhile now but I haven't found a place near me yet. This sounds really interesting! I've never seen this before. Sounds like an amazing place to visit!